Free Mixer: Hot Sauce vs. Eclectic Groove! | Hot Jambalaya! 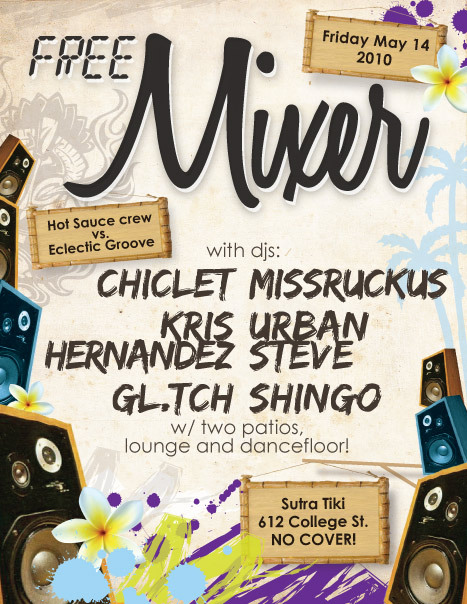 Free Mixer: Hot Sauce vs. Eclectic Groove! Join us on Friday, May 14, 2010 for a FREE night of Funky Breaks, Classic House, Raregroove, Downtempo, and of course the sheer awesomeness of Sutra’s signature VOLCAAAAAAANOOOOOOOO! This Month we are featuring MissRuckus, urbansteve & Shingo of the HOT SAUCE Crew, check the links under the bios for their latest mixes. Recently, the crew has begun writing reviews for mega-huge online dance retailer Juno Records out of the UK so you know they have the freshest tunes around! Shingo Shimizu, an Illustrator and Graphic Designer by day, has done countless artworks for house parties and events in the Toronto scene. Most notable of these are for Milk, Uproc, HotStepper Productions. As a house DJ, he mixes the vibe up with all parts of the house spectrum: Jazz, Disco, Space Disco, Detroit techno, new wave, or whatever to keep it interesting. MissRuckus started DJing in 2003 after years of pushing (unmixed) mixtapes on unsuspecting friends. Convinced her mixtape prowess would be improved if she could actually mix the songs together, she was hooked after spending a few hours at a DJ workshop for women where she learned to not fear the mysterious knobs and faders. Over the years, MissRuckus has been known to throw down eclectic selections, from the organic to the electronic to the polyrhythmic to the 4-on-the-floor to the deep & funky and all the way back again… but these days, it’s mainly the electronic end of the spectrum that keeps her most inspired. MissRuckus is a fan of putting the absolutely essential Tương ớt (aka Sriracha) on her noodles. urbansteve is a…vibe creator, mind elevator, big tune instigator. urbansteve is also known to be a sonic emancipator, bass-bin resonator, riddim detonator…and sometimes a beat orchestrator, movement syncopator, good times accentuator. urbansteve is deep, dubby tech-house, minimal, detroit some nights and funky-afro-roots-rock-reggae other nights…truly a warm groove-centric eclectic originator…catch y’all lata! And of course the EG posse will be reppin’, see ya there! It was great to see you last Friday. Looking forward to the next event because the city sure can use more alternative music in it’s bars, lounges and dare I say club. As discussed, after a 5 month hiatus, I finally brought myself around and made a djset. I’m a little rusty but with more time to put into music, I will be back in shape in no time. Let me know if you want the mp3 file – I can provide that. Peace brother. We’ll speak again soon. Posting a video of your 3 deck all vinyl mix!? If only more people could hear this. Thanks man. You are welcome to contact me any time.